"This one has marshmallows in it! It's rich, delicious, and full of calories! 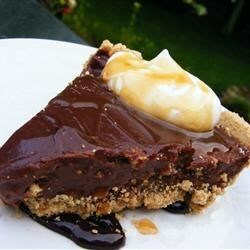 Chocolate cooke pie crust may be used in place of graham cracker crust." In a medium microwave-safe bowl, mix together cornstarch, sugar, and salt. Whisk in milk. Microwave uncovered in 2 minute increments, stirring after each increment. Continue until mixture is thickened, about 6 to 7 minutes. Add vanilla extract, chocolate chips, peanut butter, and marshmallows. Stir until mixture is smooth. Pour into pie crust. Chill at least 3 hours before serving. See how to make the famous peanut butter pie created by Serendipity 3. This pie was easy to make but the texture was a too thick, I made it twice and both times had the same results. OK, but not my favorite. This pie is outstanding! I took the advice of previous listers and increased the amount of peanut butter to 3/4 cup. The balance of chocolate to peanut butter was perfect! Loved it!!! I took it somewhere and everyone loved it they all wanted more and everyone!! wanted the recipe! Very easy, very quick. Next time I would put in more peanut butter though because I could not really taste it through the chocolate.